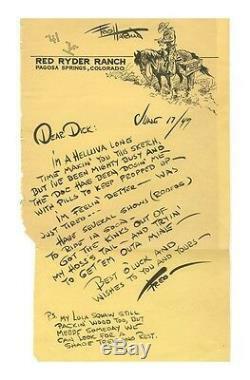 Fred Harman -'Red Ryder' Cowboy Artist LARGE Autograph Letter - One of a Kind! What a'one-of-a-lifetime' large (8 1/2" x 14") autographed Fred Harman autographed letter (1949)! Perfect piece for your western collection that you'll love! Fred Harman (1902 -1982) - American artist, best known for his popular'Red Ryder' comic strip, which he drew for 25 years, reaching 40 million readers through 750 newspapers, authentic autographed artistic handwritten letter (ALS), dated June 17, 1949. Harman was one of the original 1965 members of the Cowboy Artists of America, along with Joe Beeler, Charlie Dye, John Hampton, and George Phippen; and Harman's paintings were included in the first annual exhibition of the Cowboy Artists of America on September 9, 1966, at the National Cowboy Hall of Fame in Oklahoma City. Please note: I definitely feel the salutation, the date and the signature are genuine. Please note the salutation, the date and the signature are darker. It is quite possible that the body of the letter is a form letter that Harman later filled in with name/date & signature when he wished. This great piece has 2 horizontal folds, a small (4) fold on the bottom left corner and some light wear all of which do not affect the fine appearance/quality of the piece. Please write with any questions. The item "Fred Harman'Red Ryder' Cowboy Artist LARGE Autograph Letter One of a Kind" is in sale since Saturday, February 28, 2015. This item is in the category "Collectibles\Autographs\Historical". The seller is "mediamarket101" and is located in Evansville, Indiana. This item can be shipped to United States, all countries in Europe, Canada, China, Japan, Australia.